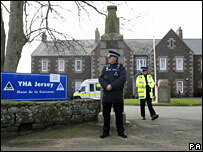 Police in Jersey are continuing their search at the former children's home Haut de la Garenne, where a child's remains were found. Here, two BBC News website readers reflect on their experiences of the home. There were two dreadful places for me - school and home. I spent two brief periods at Haut de la Garenne, and thought it was going to be a relief for me. But it wasn't. It felt unsafe. At Haut de la Garenne, physical abuse was a regular occurrence. It was common currency to be hit about the head. School was the same - corporal punishment was the routine for those who, like myself, were not 'compliant' or willingly following rigid rules. For myself, there was no-one or nowhere to go to, and it seemed that the entire adult population were doing all that they could to beat me down, physically, mentally and emotionally. Jersey is an island - there is nowhere to run to, and I ran away several times, but the reality was there was nowhere to go. There was no escape. ALL the institutions failed me. The school, which should have been a sanctuary from home, was a place I dreaded to go. The local hospital, where I received attention on more than one occasion, never reported anything untoward to the local police or the equivalent of social services. The local police, and in particular the local 'honorary' police, ever keen to ensure that these matters were resolved behind closed doors, never raised an alarm. Everything that could be done by those in authority to normalise a terrible situation was done, and more than once I was given a thick ear for trying to stand up and make complaints about actions that today would be described as assault. Life was very hierarchical in Jersey in the seventies. Like the famous milk - as long as the double cream on the surface wasn't disturbed, no-one cared what troubles there were going on underneath. I miss aspects of a very beautiful island, but sadly, memories of the wonderful nature of Jersey are overshadowed by the dreadful memories of the awful nature of some human beings. "We thought we were living through hell when we were living at home, but that was nothing compared to what we were living up there". That was something I heard about Haut de la Garenne, and just about sums it all up. I used to visit that home in the seventies on an almost daily basis. What I saw was cruel. Haut de la Garrene at the time I knew it was not an orphanage and I never knew it to be. Children were placed there because they were not wanted and they amalgamated remand children with children who had been removed from a home through no fault of their own. My best friend was in there because her mother had tried to gas herself and the children. Once the home had them they were separated within the home. There were huge families, up to 11 children from one family. Many of these children are around today and many are not. The cruelty they suffered - mental abuse, hunger and now we know in some cases sexual abuse has affected so many lives. Some took their own lives. Haut de la Garrene was divided into separate homes inside. Each unit had a house parent - these house parents in some cases were little more than children themselves, some being as young as 17. There were no cuddles, no love shown towards these children. They were names and numbers and society didn't care. If a child ran away they were rarely looked for - the consensus of opinion was that they will come back when they are hungry. It was thought that some ran away and jumped on the mail boats which left from St Helier. Did they? No-one knew any different. These children were not wanted. No-one bothered to look for them. Many children never spoke out because it was accepted that this was the life for them. Those who spoke out weren't listened to. Many islanders say it should be forgotten, it was a long time ago. Maybe for them, but the memories and the damage that home did had lived on with hundreds of children on this island. Some still, some not.